10 of the Best Spots to go Apple Picking in America! "Autumn" and "apples" are a perfect pairing. We dunk for them at Halloween or dip them in sticky caramel; there are pies and cider.... Yep, fall wouldn't be the same without the apple. Despite the saying, "American as apple pie," apples didn't originate here. Settlers to Jamestown brought seeds and cuttings from Europe, and began harvesting the fruit in 1607 - not for eating but for making cider (which was less risky to drink than water during those untidy days). Over a century later, John Chapman (aka "Johnny Appleseed') introduced the trees to parts of Ohio, Pennsylvania, Illinois, Indiana and parts of West Virginia. 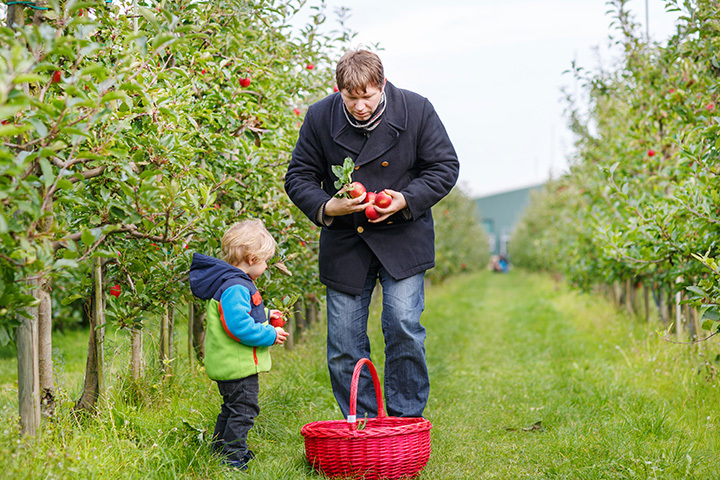 Apple picking is a fun activity for families, even the littlest members. Orchards provide bags, sacks or baskets and generally transport you to the trees on a wagon. All you have to do is pick, pick and pick. To get the best fruit, look for apples with little or no bruising, and select those that feel firm (some sweeter varieties will be a little bit softer). When you get them home, store them in the fridge - they'll last much longer than on the countertop. After that, the biggest problem you'll have is in deciding what to do with your apple-licious loot. Ready to get started? Here are ten favorite apple-picking places around the country. Twenty years ago, they made the arduous switch-over to organic growing practices; now they're one of the largest certified organic farms in the Northeast. Take your pick between delicious Empires, Honeycrisps, Macouns and more on this farm that's been in the same family for eight generations. They also offer organic apple-cider vinegar, and - because it IS Vermont, their own organic maple syrup. This charming small orchard offers a great selection or organic apples to pick, and when you're done, stop in to their "tasting room" for a swig or two of their hard cider. Besides apple picking, they offer some interesting seminars on sustainable practices, fermentation and more if grown-ups want to bite into something other than a Macintosh. As a kid in the early 1950s, Dave Hull began planting apple trees on his parent's property. Over the years, the orchard thrived and became the place to go in autumn to find great apples. Dave was so passionate about his orchards, that the name was changed after his death from "Applewood Orchards" to one that honors the loving care he put into the place. The farm has been there since 1886 - and is so beloved that a few workers recently got together to purchase and maintain it, rather than see the land turned into more suburban condos. Besides the 14 different kinds of apples for picking, a stop at the Farm Store is a must for apple cider donuts, cider and other goodies. Nestled in the Shenandoah Valley lies this historic orchard; the family has been growing fruit for over 200 years. There are 2,500 apple trees, and about 25 different varieties, from traditional Red Delicious and Granny Smith to less familiar Rambo, Greening and Smokehouse. The warm days and cool nights atop Mount McAlpine in the Blue Ridge Mountains make for perfect growing conditions. There are over 25 different varieties of apples - and as a bonus, munch on an apple cider donut as you take in breathtaking views of the Pisgah National Forest. Just 30 miles outside of Minneapolis lies this popular destination for filling up a basket or two. The 4,000 apple trees were specially-propagated to withstand brutal Minnesota winters (up to 35 below). Choose from ten different apple varieties; when you're done, head to the rustic barn on the premises for a mug of their own apple cider. In a state known for apples, this place is a favorite. It was established by Swedish immigrant Alfred Johnson over a hundred years ago, and has long offered up some of the best apples anywhere. Gala, Ginger Gold and Honey Crisp are popular picks. Take home a fresh pie if you need even more of an apple fix. The glacier-fed water sources and rich soil around the base of Mount Hood are perfect for growing fruit. They offer about 40-plus different types of apples - but if you don't know where to start, their "apple tasting" gives you a chance to zero in on new favorites. They also offer an online "ripenes calendar" so experienced pickers can see what's ready for the basket. Since its inception in 1906, it's grown into the largest apple farm in Southern California. The orchard is comprised of 8,000 heirloom trees offering 32 different varieties. Traditional farming methods are used (meaning: no pesticides or chemicals). And you can even "press" your own cider.